...is fast approaching. I'd best get started on a few projects. I'm holding a Mother's Day Stamp-A-Stack class on the 9th of May (Mother's Day is the 10th). If you are local, you are welcome to come by and make a card or two. This is one of the cards we made at last year's class. 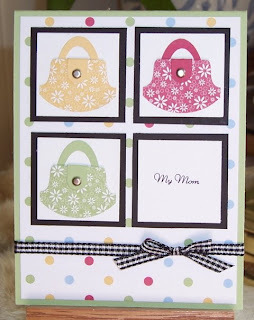 I can't take credit for the design, it was CASED from this card on SCS by Nancy Riley. She has an awesome blog as well, iSTAMP. I won't bore you with all the details. I will tell you how these adorable purses were made though. The handles were made by punching a small oval in solid card stock and then punching around that with the large oval punch. The closure is the word window punch 'secured' with a silver brad. The 'designer' purse uses the round tab punch and SU! 's retired prints designer papers. So, what do you think? Really simple and a really big hit at last year's class. Look for some new purse designs at this year's class! On a 'purse-onal' note...Adam's party was fantastic! He has some really great friends and so do I! I spent Saturday at MedExpress. I thought I had broken my foot. Thank heavens I didn't but it is sprained and I'm limping along in a boot. I was running - no - limping very behind on Sunday and as everyone arrived, they jumped right in and helped me get it all done. How behind was I? Put it this way, a HUGE thank you goes out to my good friend, Kristen! She frosted the cake for me. My mother-in-law will never call to ask if I need anything again. Little did she know that I'd give her a grocery list! Like I said, I have some great friends. Thanks to each of you. You ROCK! Until next time, try out a designer purse or two. Better yet, one for every day of the week!